Update: (4/2014) Thanks for the prayers. The Lord has led me to a new area… I am settled and have a new class to teach!! Praise Him!!! After Saul’s conversion in Acts 9, the churches throughout the region were walking in the fear of the Lord and in the comfort of the Holy Spirit. (Don’t you all hope and pray your church would experience this level of commitment? Let’s keep praying for revival!) 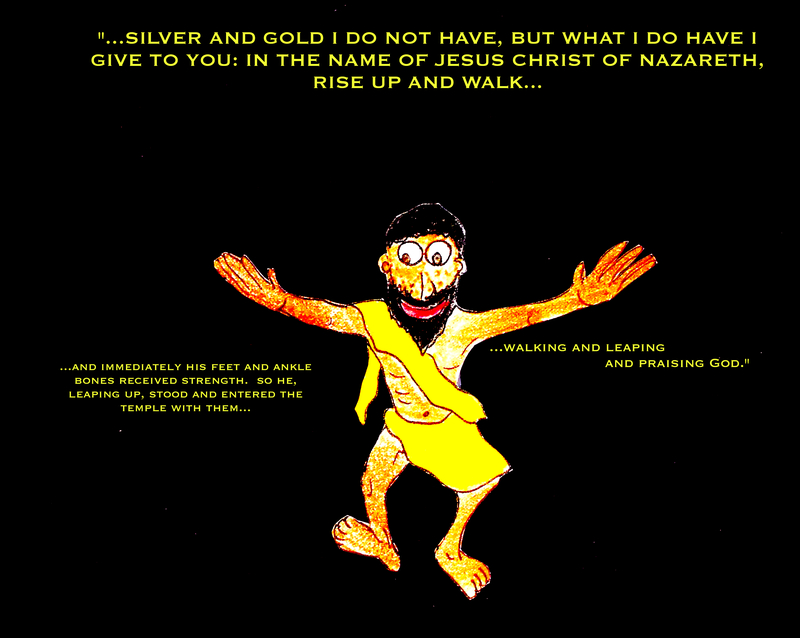 Peter went to edify new believers and came across a paralyzed man in Lydda named Aeneas. 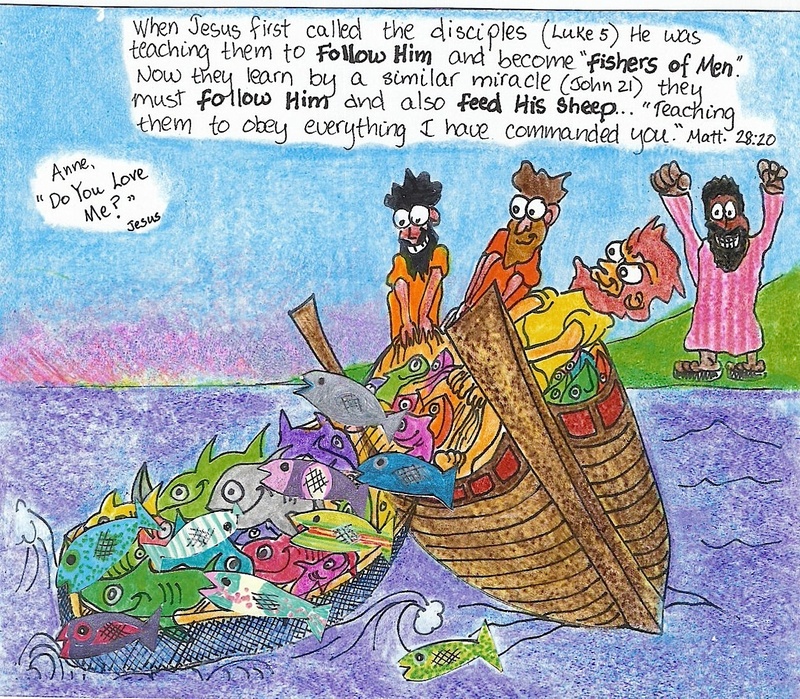 He told the bedridden man that Jesus was healing him, and as a result many converts were made. About ten miles away in Joppa, a disciple named Tabitha (gazelle) became sick and died. This woman was greatly beloved and described as being full of good works and charitable deeds. The disciples in Joppa , having heard of the great miracle in Lydda and realizing Peter was still in the vicinity, rushed to implore Peter to accompany them to pray for their departed sister. When he got to the place where she was laid, he noticed the grief of the widows, who stood holding the garments she had made for them when she was alive. 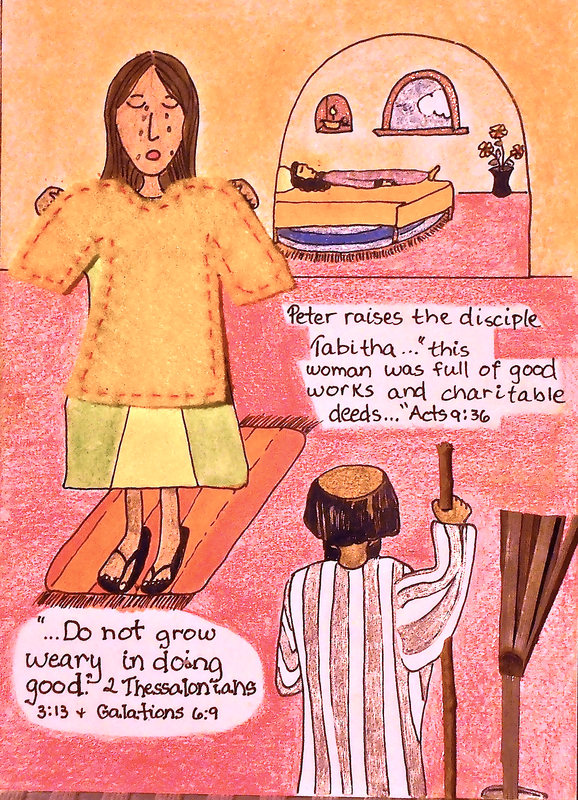 Peter privately knelt down before the body and prayed… “And turning to the body he said “Tabitha, arise.’ And she opened her eyes, and when she saw Peter, she sat up.” This also resulted in many believing on the Lord. Peter continued his sojourn in Joppa and was there when the servants of Cornelius came looking for him. Using the pattern, cut your tunics out of felt. Older kids can do a simple running stitch to add another dimension to the project. 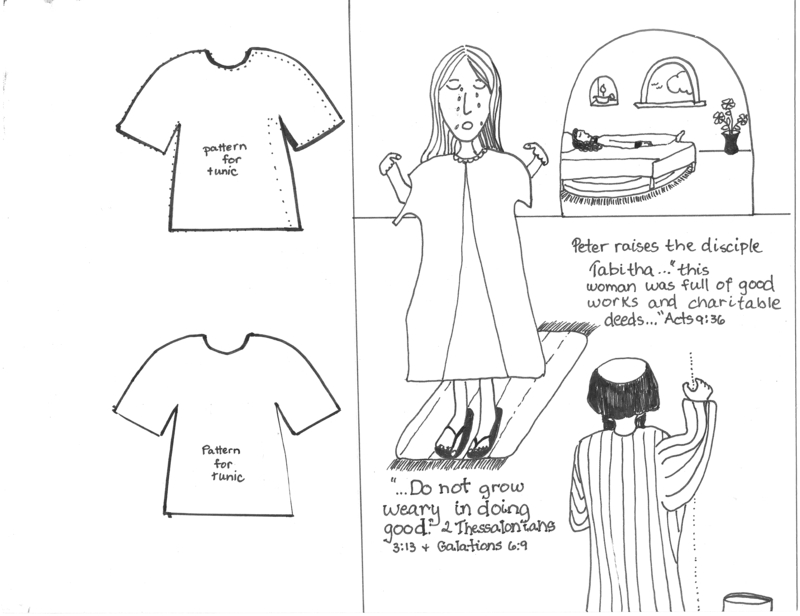 Color your page before tacking down the tunic. When I was out walking this morning, I came across some twigs that would make a good walking staff for Peter. There are other amazing bits of nature you might be able to find, to make a broom. The Apostle James has been killed by Herod and because there was such a favorable response from the Jews, he imprisoned Peter, who was to face a similar fate…but the church was praying without ceasing for him. Peter was heavily guarded and secured with chains but an angel of the Lord was sent to rescue him. As he walked out of the prison with the angel, he thought it was all a dream and it wasn’t until he was outside on the street that he realized he was truly free. He came to the home where the church was meeting and still praying for him and knocked on the door. He had to knock for quite a while as it was hard for them to believe he was freed and their prayers answered! This is a fun project but very messy. Have the kids choose light, bright crayons and fill a page with color. It should be a space about 5 inches by 7 inches. Make sure they apply heavy pressure. The coloring needs to saturate the page. Now they will cover the area they have just colored with black crayon and then comes the fun part…..they scratch the design….fingernails work great but you might want to provide something to scratch with…experiment with a paper clip edge….somethings work better than others. 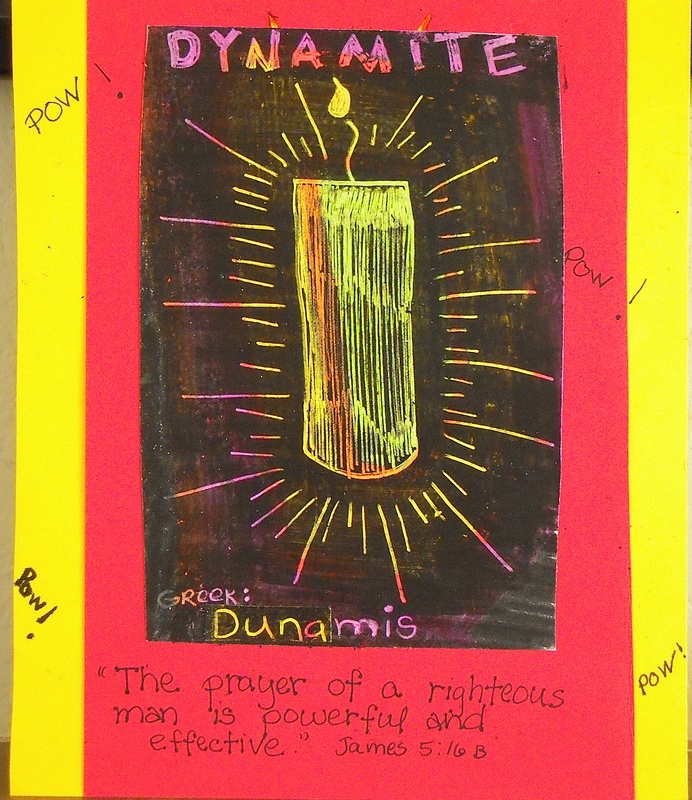 The verse is from James 5:16b “The prayer of a righteous man is powerful and effective” and I have the kids write the verse on another paper and glue their dynamite page to it. The church was growing in Jerusalem but there was a new thing God wanted to do. Since Jews did not associate with non-Jews, the message of salvation was not being shared with the Gentiles. 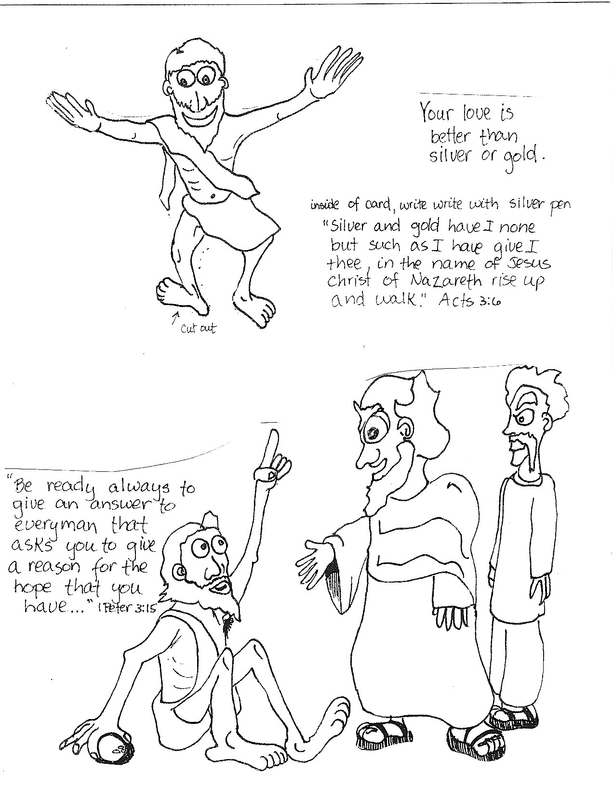 This all changed when a God-fearing Roman centurion was visited by an angel and was told to send for Peter in Joppa. While these messengers were on their way, Peter was also having some excitement on the rooftop of where he was staying. 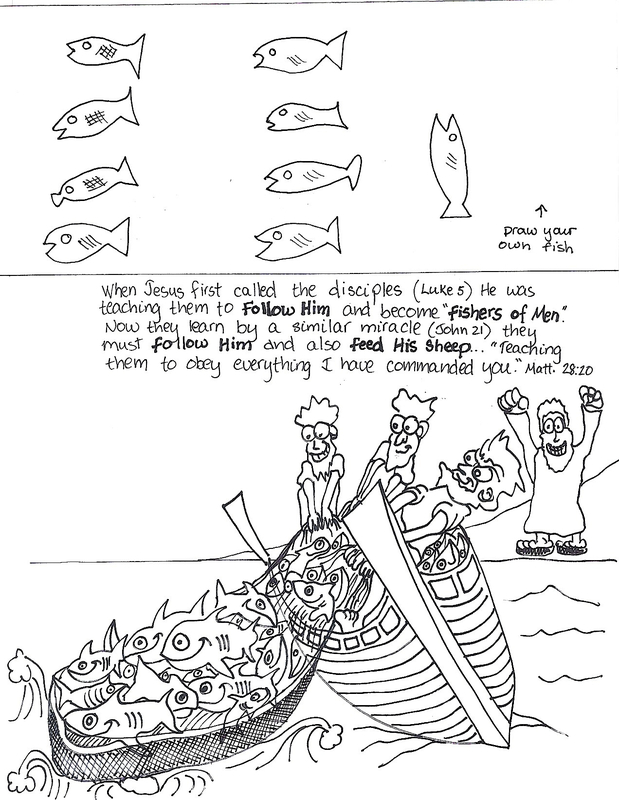 A giant sheet was lowered from heaven , full of unclean animals that had never entered his mouth. A voice told him to kill and eat but Peter answered, “No, Lord!” This happened three times and then the messengers from Cornelius arrived. 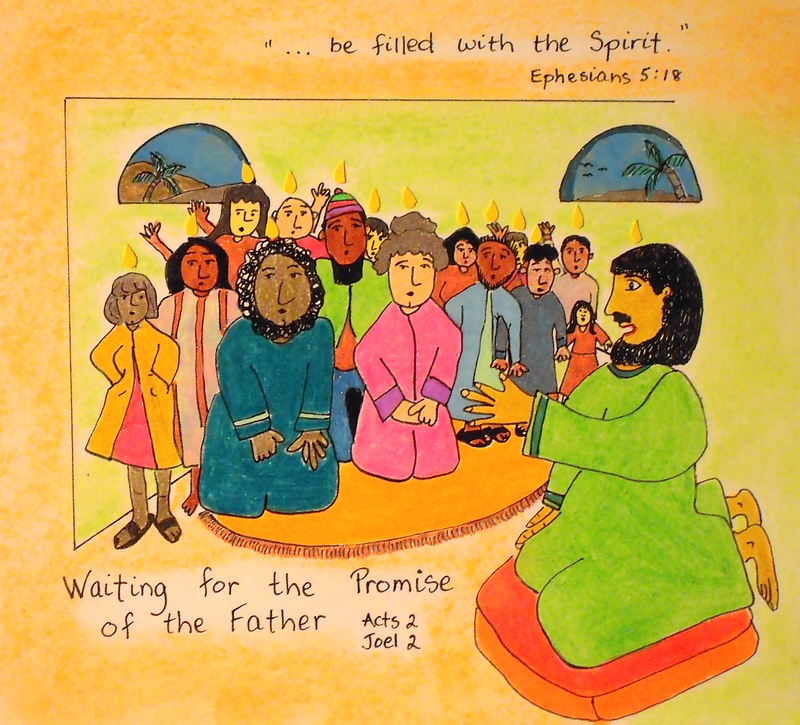 The Holy Spirit told Peter to go with the men who had arrived. He must have been surprised to find out his guests were not Jewish. He went with them to the home of Cornelius and explained to those gathered that salvation was available to them because of the price that was paid for their sin by the death and resurrection of the Son of God. They were encouraged to receive forgiveness of sins by believing this truth and all the Jews there were astonished to discover that the gift of the Holy Spirit was also poured out on the newly-converted household. 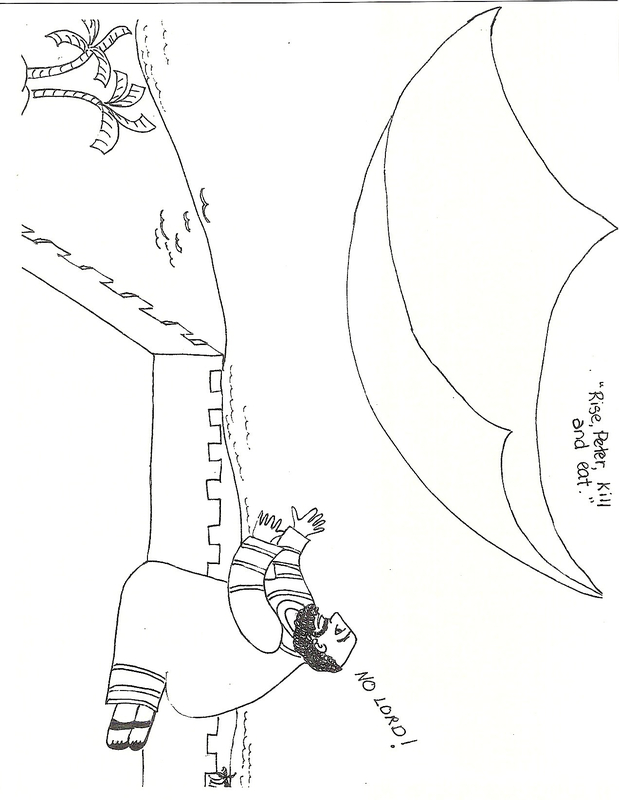 When certain Jewish Christians first heard that the Gentiles had also received the Word of God they contended with Peter until he explained to them what had happened, starting with his vision and ending with the gift of the Spirit being poured out on the Romans.If you want your sheet to “pop” you will have to color the sky. I recommend colored chalk for your “lazy” colorers….if you place 1/2 a piece of chalk on its side, you can apply color in seconds! 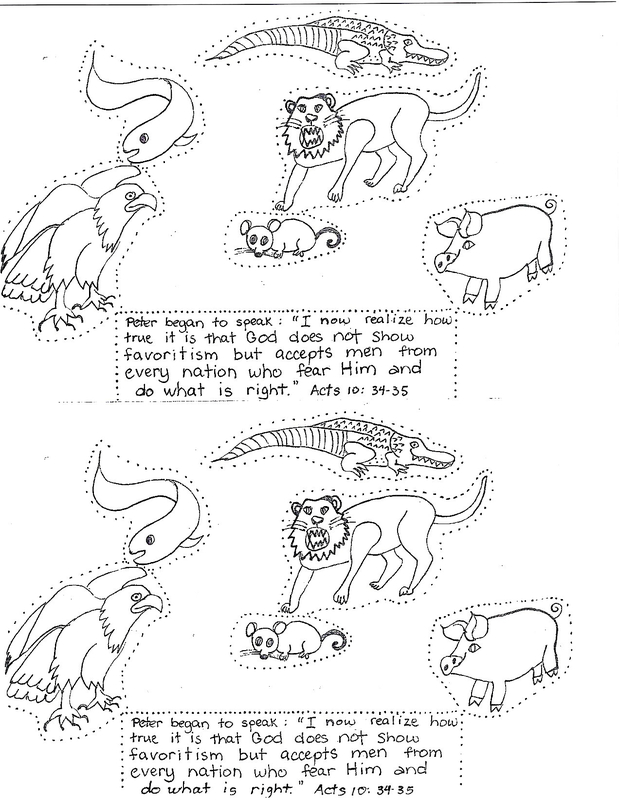 Color and cut-out animals and glue on sheet and verse. O.T. dietary laws and a list of the unclean animals can be found in Leviticus 11. The new church was growing . Those saved on the day of Pentecost were continuing “steadfast in the apostles’ doctrine and fellowship, in the breaking of bread, and in prayers…many signs and wonders were done through the apostles…and the Lord added to the church daily those who were being saved.” Acts 2: 42-47 Peter and John were going to the temple to pray when they met a lame man who had been carried daily at the gate of the temple called Beautiful, to ask alms of all who entered the temple. Perhaps he was begging there when the Savior was in Jerusalem! 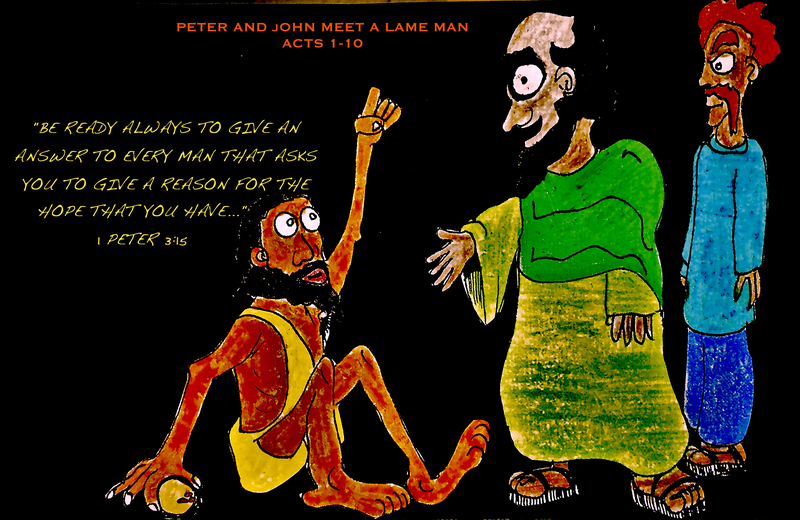 He asked alms of Peter and John but got something much better…”The faith which come through Him (Jesus) has given him this perfect soundness in the presence of you all.” Acts 3:16 Peter used this occasion to preach another sermon and many who heard the word believed, in spite of his arrest. Fold your background paper in half. 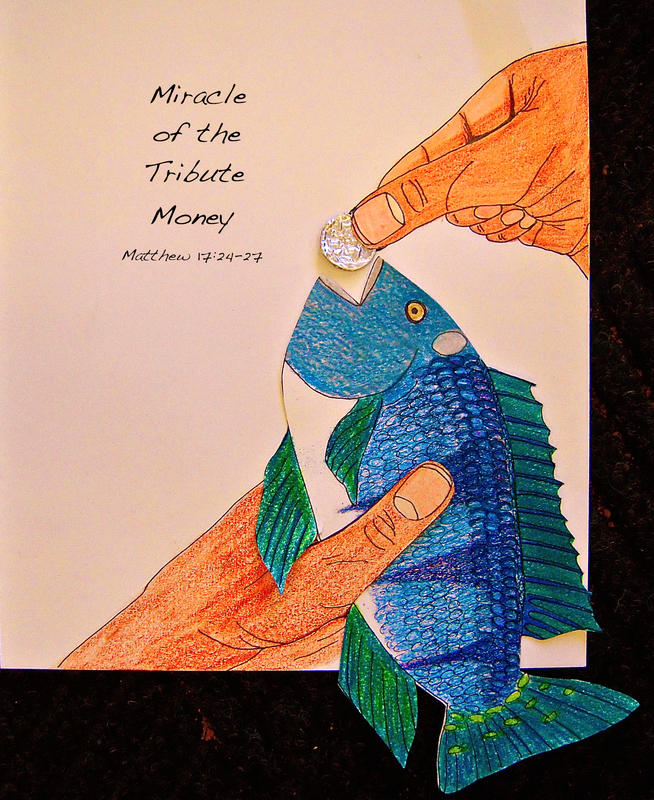 Peter and John and the lame man go colored and cut out and glued on the cover…your fold will be at the top. Write verses. Your healed man goes glued inside. Make a “Jacob’s ladder” to place under figure so it will jiggle. Write verses. Use gold or silver pens on black backgrounds. (see you-tube for instructions on making a jacob’s ladder) If you choose another color for a background, use any shade of ink. 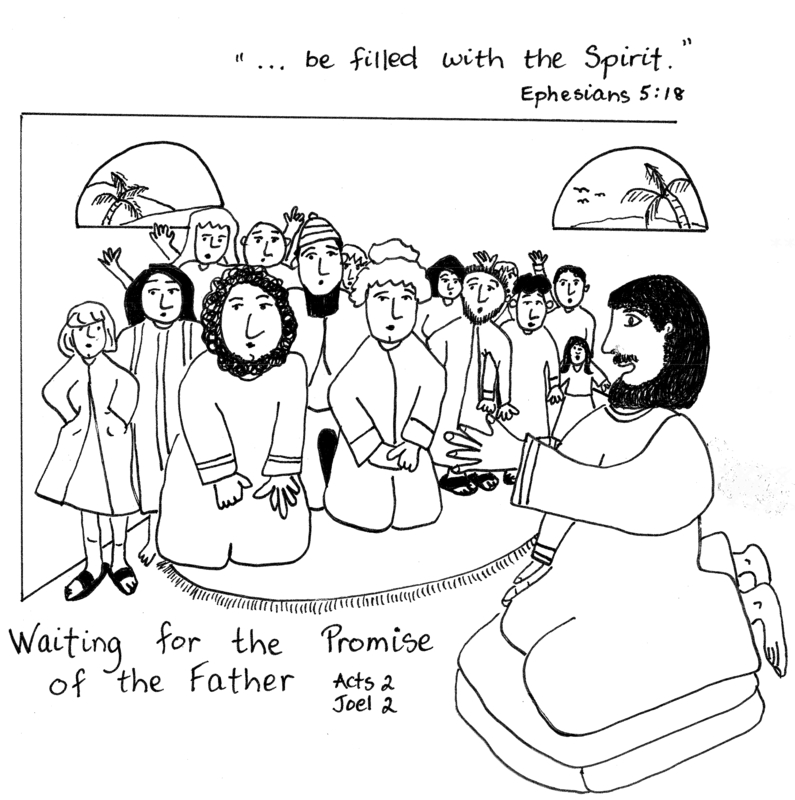 About 120 follower’s of Jesus were assembled in Jerusalem waiting for the promise of the Father. The Holy Spirit was given to fill them with the power needed to be His fearless witnesses “unto the uttermost part of the earth”, guide them into all truth and bring to remembrance all Christ had taught them. 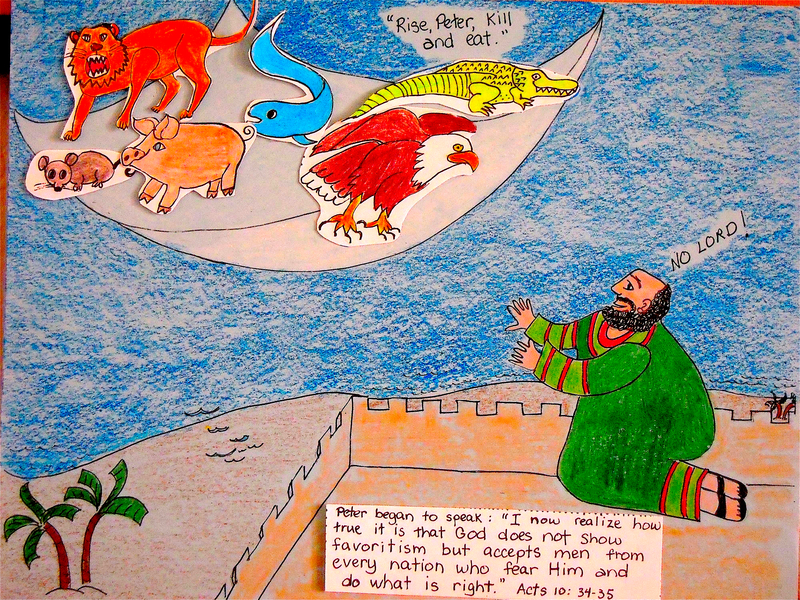 After being baptized with the Spirit on the day of Pentecost, Peter preached his first sermon and about 3,000 souls were added to the church. (Do you remember when Moses came down with the Law, he had to administer judgement as a result of the people’s idolatry and about 3,000 people perished?) “…for the letter kills, but the Spirit gives life.” 2 Corinthians 3:6. I used a heart-hole punch to makes the flames by cutting yellow hearts in half. _ _ _ _ _ _ _ _ me to be a witness for Jesus. (Empowers) if it helps, you can write the first letter in the blank! He lives in me _ _ _ _ _ _ _ . If you have time have the kids look up 1st Thess. 5:19 and explain that the Spirit can be quenched which will take some explanation and definitions. I drew a picture of a hose watering a flower and then asked them what happens when the hose gets a kink…. or some electrical appliance that loses its power when the cord gets unplugged… they can write this verse wherever there is room on the paper. 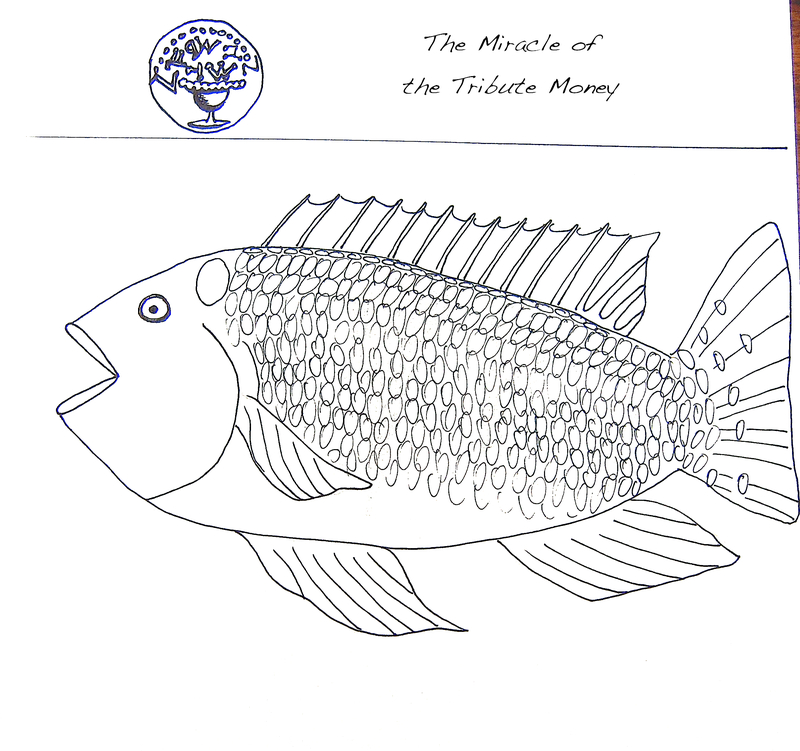 I always recommend coloring the fish and main page , before cutting and gluing the rest of the fish. If you have any “tulle” (and the color is not too outrageous) you can cut out a rectangle shape to glue over the fish…that way they look like they are caught in the net.